It’s gone. In one fell swoop, you lost the money with which you were planning to gamble over the next few days. You were overzealous, and probably a little too confident, about your bets. What seemed like a sure thing was obviously a mistake. And now you’re stuck in the largest gambling center in the world unwilling to lose any more patacas. Now what? It’s time to leave the Macau Peninsula’s casinos, shopping malls, and high-rise hotels behind. Cross the dragon-shaped Old Bridge to Taipa, one of Macau’s two islands. You’ve actually already been here. The international airport sits on reclaimed land on the eastern side of Taipa. You were too jet lagged and focused on your future earnings to pay attention to the residential area, though. But now, it’s time to return for a glimpse of the real Macau. Macau is one of China’s two special administrative regions. Similar to Hong Kong, the former Portuguese colony has its own currency, customs and immigration policies, and legal system. It’s become one of the richest cities in the world, as well as one of the most-densely populated. The Macau Peninsula, which is connected to the Chinese mainland, is filled with traffic, cranes, and tourists. But its two islands—Taipa and Coloane, plus the reclaimed land that now sits between them—are more known for their traditional communities, delicious food, and quiet hiking trails. Visit the well-preserved Taipa Village. It has narrow lanes, traditional shops, and wrought-iron benches. Eat your way through Rua do Cunha. Wild-boar jerky, egg rolls, and almond biscuits are sold on the pedestrian-only food street. Tour the Taipa Houses Museum to see displays about the island’s fishing, duck farm, and colonial history. Walk down Estrada Lou Lim Leok, which is lined with colorful mansions and vintage cars. The Pou Tai Un Monastery, on the right-hand side of the street, is the island’s largest temple. Then go hiking in the Taipa Hills. 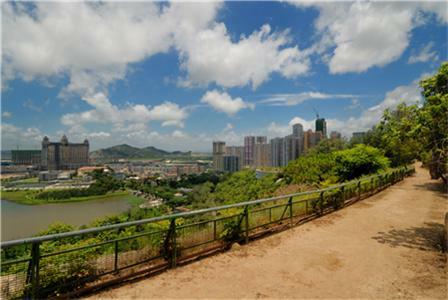 Taipa Grande Nature Park, on the eastern side of the island, is home to a sculpture park, a popular grass slide, and plenty of barbecue areas. The Taipa Grande Trail winds through the park. The first section is wide and relatively flat. Egrets walk in the wet grass. The middle section becomes steeper and more challenging. Then stone steps lead to Taipa’s highest point. You pause to wipe the sweat from your brow and take in the sweeping view over the island and the harbor. It’s a side of Macau that few visitors, especially gamblers, get to see.